This year we teamed up with the Cold Regions Research and Engineering Lab (CRREL) (thank you Dave Finnegan and Adam Lewinter for the collaboration to produce repeat LiDAR surveys of our Rio Behar catchment primary study areas). LiDAR stands for Light Detection and Ranging (or, depending on where you are in the world, Laser RADAR), and it measures distances by using lasers. Basically all we’re doing is measuring the time it takes for a short duration pulse of laser light to leave the instrument, fly through the air, bounce off an object, and return to the receiver. We divide that round trip time by 2, which gives us our one-way time of flight, or the distance from the scanner to the object, and then multiply that by the speed of light, which gives us a distance. The topographic LiDAR systems we use sends out hundreds of thousands of pulses per second spaced very closely together, to build very accurate (sub centimeter) 3D models of whatever we want to image. The data we collect from these instruments is very compelling, information rich, and usually pretty easy to interpret, since it’s all in 3D and we’ve evolved to orient ourselves and understand our surroundings in three dimensions. Here is a screen shot of a 3D LiDAR scan point cloud featuring one of our tents that we used to keep batteries, instruments and people warm while at ice camp. LiDAR instruments have been used in the Arctic and Antarctic for a long time, from stationary terrestrial systems like Dave Finnegan (USACE-CRREL) and Gordon Hamilton’s (U-Maine) ATLAS project, which measures glacial flow at the Helheim Glacier, airborne systems like NASA’s Airborne Topographic Mapper (ATM), which is part of Operation IceBridge, and NASA’s Land, Vegetation and Ice Sensor (LVIS), which is now flown on its own dedicated aircraft. There are also space borne systems such as NASA’s ICESat and the forthcoming ICESat-2 mission with a planned launch date in 2017. There’s even UAV based system that we hope to fly in Greenland and Alaska soon! There’s always a tradeoff between cost, resolution, collection rate, and collection area size. The ICESat projects can collect huge areas (nearly the whole planet), but are expensive to build and operate, and have comparatively coarser resolution. Airborne systems are cheaper than satellites and can collect higher resolution data, but flying airplanes gets expensive and are very inefficient if you want to collect small study areas at a high temporal frequency. Terrestrial LiDAR Systems (TLS) are small and comparatively inexpensive, can collect VERY high resolution data (sub centimeter) at a very high temporal resolution (same area every few minutes in order to find small-scale changes in the environment), but can be range limited and can only collect small areas (limited by the number of times you can safely pick up the scanner and physically move it from place to place). We saw a unique opportunity to use a TLS at ice camp this year for a number of different purposes. The primary science objective was to measure the bulk ablation rate of the ice around Rio Behar. This is usually measured using ablation stakes, but measuring ablation stakes is time consuming and can be error prone. Additionally, we can’t put stakes everywhere, so we’re only able to measure ablation at specific points. We think that by using a TLS we can measure ablation at high spatial resolution over a large area, quickly, accurately, and non-destructively, providing an accurate comparison with our coincident measurements of flow in the river. The flexibility, high temporal and spatial resolution, and cost to operate made a terrestrial system a good choice for us. We used a TLS made by Riegl called a VZ-400. It’s small, about the size of a large food processor, weighs about 40 lbs., and has a 400-600 meter range in optimal conditions. The laser operates at 1550 nanometers, in the infrared portion of the electromagnetic spectrum, which is great because it won’t damage anyone’s eyes and works well in most environments. One downside for our project is that wet snow has the same reflectance as black asphalt at 1550 nm, so our maximum effective range is more like 100 meters, not 400 meters. 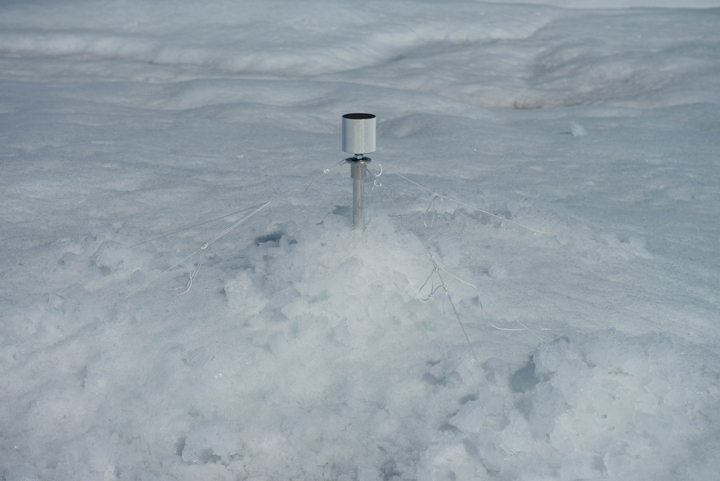 That’s ok though, because due to the low height of the scanner off the ground (about 6 or 7 feet), the ice hummocks in our ablation plots cause shadows in the data. The big problem we had to solve was keeping the scanner completely motionless while collecting data. In order to measure change over time, we have to register each new scan to the scans from the day before, and we do that using a combination of aluminum cylinders with reflective tape on the outside placed in the field of view of the scanner and GPS measurements. We can use those stationary objects to tie the scans together, but only if they don’t move over the course of the week. If the tie points move, the day-to-day registration will be poor. The parameters we used resulted in each scan taking about 32 minutes to complete. If the scanner moves or shifts due to melt or wind during a scan, the data will be distorted and will have to be recollected. Stabilizing the control network as much as possible on ice in the ablation zone, which is an environment where everything is moving, required some extra work. Minimizing the amount that the tripod melted or moved in was the key to collecting the best data we could. This is one of our LiDAR reflectors. We also use a differential GPS to survey the precise location of each of these LiDAR reflectors. We started all of our LiDAR scans and GPS surveys at 3 am each morning to minimize movement of the LiDAR and the GPS due to melt. (Photo by: Charlie Kershner). The LiDAR reflectors were installed atop 2-meter-long aluminum poles drilled into the ice deep enough so only 10 or 20 centimeters remain above the surface. 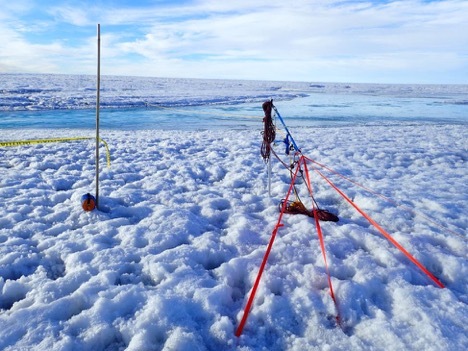 To add some extra stability, we tensioned the poles to the ice using cord and v-thread anchors. We stabilized the scanner and tripod by digging through the first ~20 cm of the weathering crust and securing custom engineered tripod feet to the ice with ice screws. We then buried the feet of the tripod to minimize melt around the feet (a big deal this time of year, since the sun never sets!). These feet helped distribute the weight of the scanner over a larger surface area in order to slow the rate of ablation and associated movement of the scanner. Finally, we started collecting LIDAR data every morning at 3 am while the sun was low in the sky and temperatures were a few degrees below freezing. The cold temperatures helped in three ways: (1) the ice under the weathering crust was harder, which provided a stable surface for the tripod, (2) lower sun angles warmed the tripod legs and plywood less than they would during the middle of the day, helping minimize melt, and (3) when it was cold there was less meltwater on the ice which made the surface slightly more reflective than wet, slushy ice at 1550 nm, which gave us a little extra range with the scanner. The opportunity to take amazing photos in the beautiful light and long shadows at this time of day was an added bonus! The view from the river toward our tents. (Photo by: Charlie Kershner). Now that we’re back home, the process of data registration and processing begins. 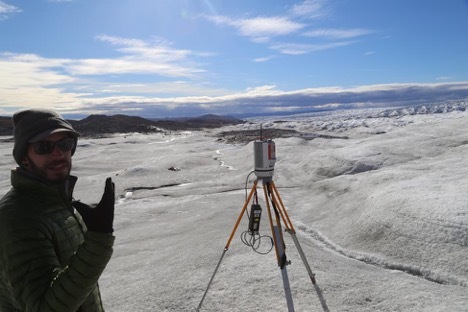 It’s not quite as much fun as collecting the data in such an amazing place, but we’re all excited to see what the data tells us about the dynamic processes in the ablation zone of the Greenland Ice Sheet. If you want to see what LIDAR data looks like for yourself, check out plas.io or speck.ly, and interact with some sample data in a web browser. Also, GRiD and OpenTopo are two places with lots of LIDAR data from all over the world that you can download and explore. Our team got out of the field a few days ago after a successful field campaign with a lot of great data to analyze! For the coming blog posts, we will be sharing with you the different kind of measurements we made during our stay at the ice camp and but also describe the wide range of instrumentation being used. But before going in those details, here is a photo of our camp in relation to the supra-glacial lake and river to get you situated. General view of our ice camp with a close up on Rio Behar at the bottom of the photo. Photo by Clem Miege. For the ground-penetrating radar measurements, we brought to the ice camp a radar designed by GSSI, a company specialized into geophysical measurements. The radar basically acts as our eyes to explore the features located in the ice, below the surface. With a 400 MHz antenna, we are limited to look at the first 50m of the ice thickness with a vertical resolution of about 10-20 cm. Any changes in the ice density, stratigraphy or changes in its dielectric properties create internal reflections. We then follow and trace those continuous reflections (also called internal layers) and look at their spatial distribution. In addition, the presence of water within the ice generates a sharp and bright radar reflection because of the significant dielectric contrast between the solid and the liquid phase of the water molecule. The radar system is made of an antenna and a control unit. It is relatively light and portable, making it possible to use with only one person. To geolocate the radar scans in relation to the ice surface, we carry a precise GPS. The radar setup with the GPS antenna. Photo by Charlie Kershner. The radar in action. Photo by Lincoln Pitcher. In addition to the GPR work, we have been drilling 10 boreholes from the ice surface. Big thanks to Bob Hawley at Dartmouth for letting us borrow his coring drill. We extracted 75-mm-width ice cores in the top part of the ice column (1 to 2 meters depth) which reveal the ice stratigraphy and densities below the surface. We also measured the height of the water in the borehole (if any) which will be helpful to establish an accurate depth profile for the radar data. 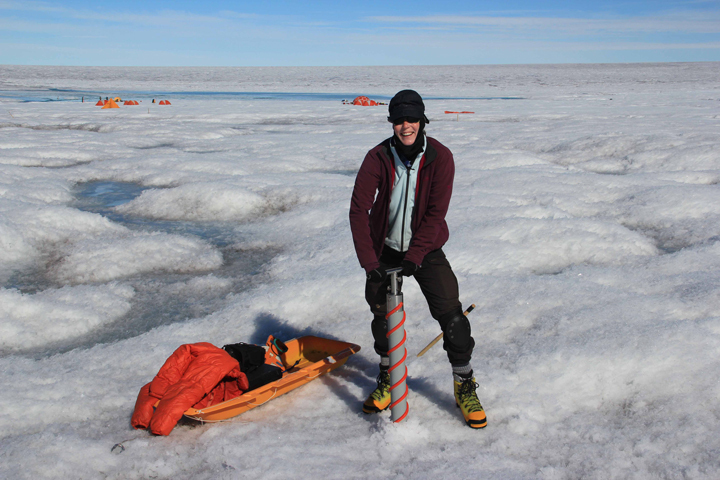 Asa is operating the coring drill from the surface to retrieve ice cores. Photo by Clem Miege. Clem is processing the first meter of the ice cores, logging mainly stratigraphy and densities. Photo by Matt Cooper. Back at the office, we will have quite a bit of work to process all the data collected and connect the ice-core data with the radar data. This dataset will become very helpful to understand the formation of the weathering crust as well as the water being stored in it. That is it for this post! Thanks for following us and there will be more blog entries soon so you can learn about the other instruments deployed on the ice. After an early breakfast, our team is getting ready to put in our ice camp. We met with the pilots around 8:30am for a departure at 9 am. The flight to the ice camp was quick, about 20 minutes. Beautiful views of the fjords leaving Kangerlussuaq and then on our climb onto the ice sheet we saw the first supraglacial rivers flowing over the ice sheet. After arriving at our camp location, a team of two got back in the helicopter to be ferried to the other side of the river. The plan was to anchor a Tyrolian line across the river to suspend an Acoustic Doppler Current Profiler (ADPC) on the river and collect data. In the meantime, the team members set up tents, and outhouse, a kitchen tent and organized the camp. In the afternoon, the team of two was picked up from the other side of the river and brought to camp. We got to spend our first night on the ice sheet, nice, quiet and not too cold! See below a few photos taken that first day. First views of the rivers sitting on the ice sheets. Photo by Brandon Overstreet. 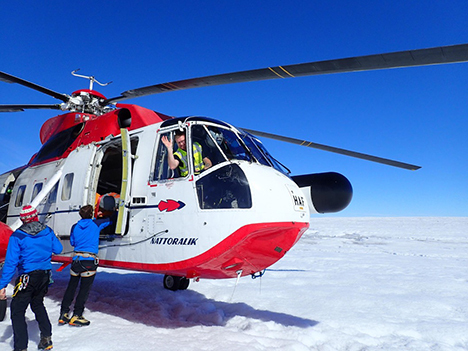 Unloading the helicopter shortly after arriving at ice camp location. Flemming, our helicopter pilot says hello! Photo by Lincoln Pitcher. Brandon posing in front of the gear and the helicopter at the background. Photo by Lincoln Pitcher. Rigging up the tyrolean system to move gear across the river. Photo by Brandon Overstreet. 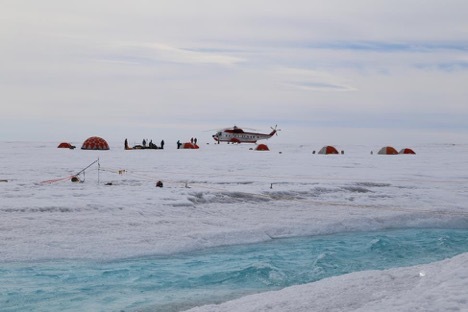 Caption: View of ice camp and helicopter. Photo by Lincoln. We will send new updates once we are back from the ice camp around July 14. Best wishes from our ice camp! Lake and Rio Behar views from the helicopter. Photo by Clément Miège. 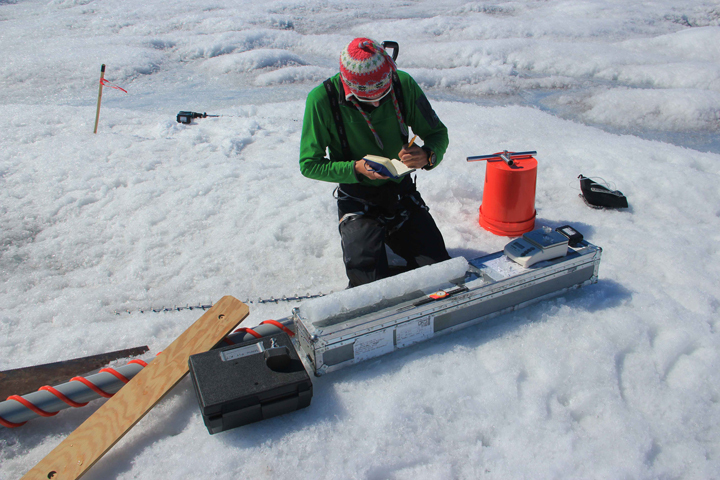 This summer, we have the chance to be part of a team of researchers studying the efficiency of the drainage system over the ablation zone of the Greenland ice sheet. 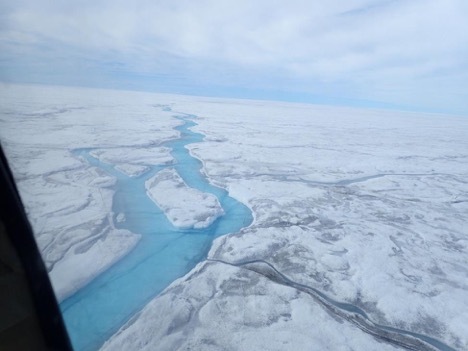 This NASA Cryosphere program funded project, titled “Drainage Efficiency of the Greenland Ice Sheet” is studying the production, transport and export of Greenland Ice Sheet meltwater and its importance for global sea level rise. 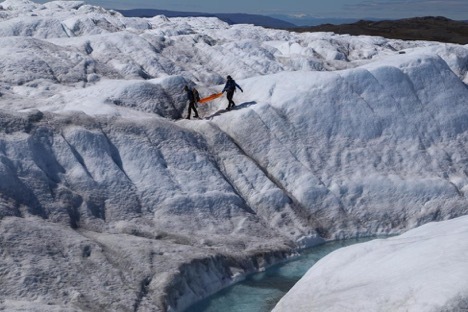 Each summer, a complex yet poorly studied system of thermally eroded meltwater streams forms across the surface of the Greenland Ice Sheet and transports meltwater into the ice sheet via moulins. 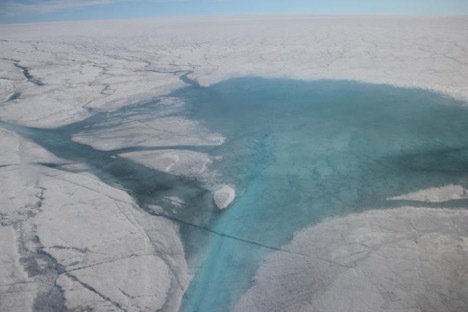 Meltwater then exits the Greenland Ice Sheet and makes its way to the global ocean via land-based proglacial rivers and buoyant sediment rich plumes. 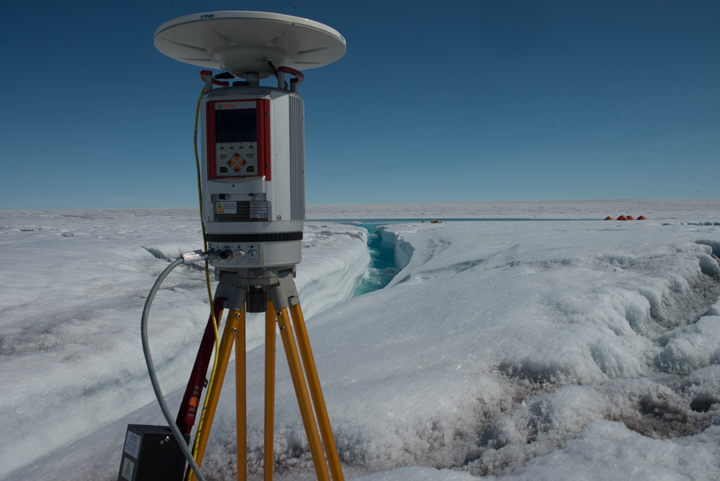 This project intensively maps, monitors and measures both supraglacial and proglacial rivers to improve estimates of Greenland Ice Sheet surface mass balance and its impacts on global sea level rise. 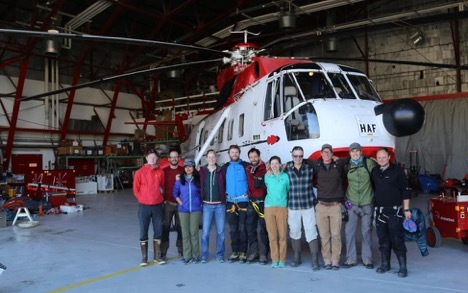 To do this work, we will be located in the ablation zone of Greenland ice sheet, at about 80 km from Kangerlussuaq (the closest town) and 1200 m elevation. Our study site is located right next to a lake and a river called the Rio Behar. As you can see from the photo above, this part of the ice sheet is covered by lakes and rivers that are transporting meltwater away from the ice sheet throughout this connected system. To study this area, we have researchers from different universities coming in with different background, therefore bringing various expertise and skills to ensure success of this expeditions. The two main institutions responsible for this work are UCLA (Project PI Larry Smith, and his students Lincoln Pitcher, Matt Cooper, Sarah Cooley) and Rutgers University (Project Co-I Asa Rennermalm, and her students Rohi Muthyala and Sasha Leidman. They were also able to invite a few additional researchers to complete the field team. Brandon Overstreet comes from the University of Wyoming and will be in charge of the river work to measure river flow and discharge. Johnny Ryan is at Aberystwyth University in the UK and will be flying over the entire catchment area with a fixed-wing drone. 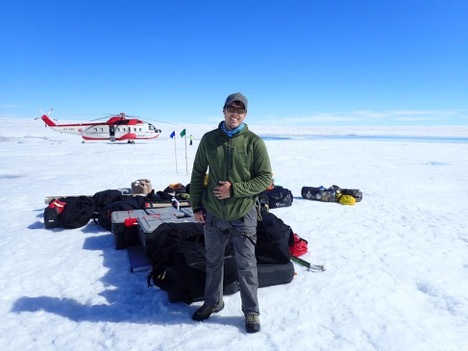 Charlie Kershner is based at George Mason University and will lead terrestrial lidar scanner (TLS) measurements to get high-resolution surface topography and deduce melting rates. Finally, Clem Miege is at the University of Utah and will be leading ground-penetrating radar measurements to look at the weathering crust and any englacial features. Team posing in front of the helicopter that will take us to our ice camp. From left to right we have: Johnny, Charlie, Rohi, Asa, Matt, Clem, Sarah, Larry, Sacha, Brandon, and Lincoln. 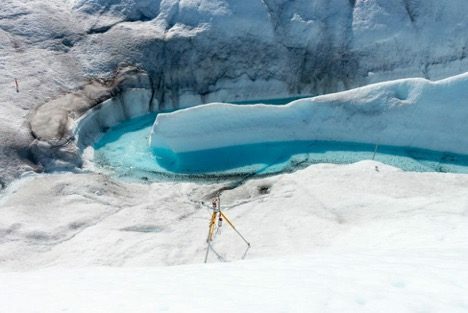 To complement, the ice camp work which will take place between July 4 and July 14, a few team members will also monitor proglacial rivers and streams near the glacier edge. Matt, Sacha, Sarah and Rohi are leading this effort and invited Charlie and Clem to come over and test their equipment on the ice edge. This test day was great, as you can see from the few photos below. 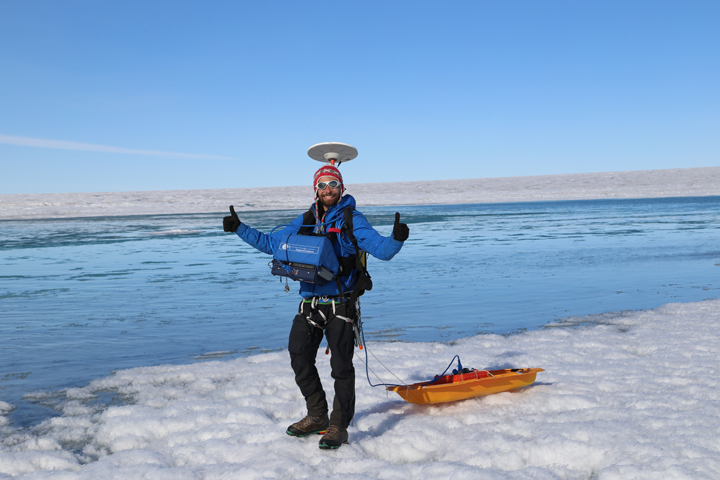 Charlie is testing his Lidar system at the edge of the ice sheet. Photo by Lincoln Pitcher. Charlie’s Lidar in action at the river bend. Photo by Charlie Kershner. 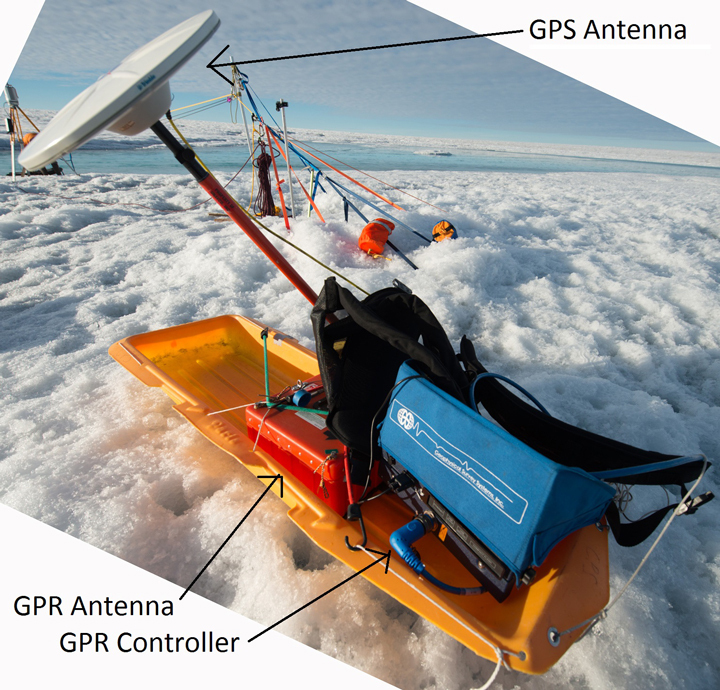 Charlie and Clem are carrying the ground-penetrating radar over the glacier, the surface roughness made it difficult for the radar to operate. Photo by Lincoln Pitcher. That is about it for now as we are finishing sorting through our equipment before getting to our ice camp. 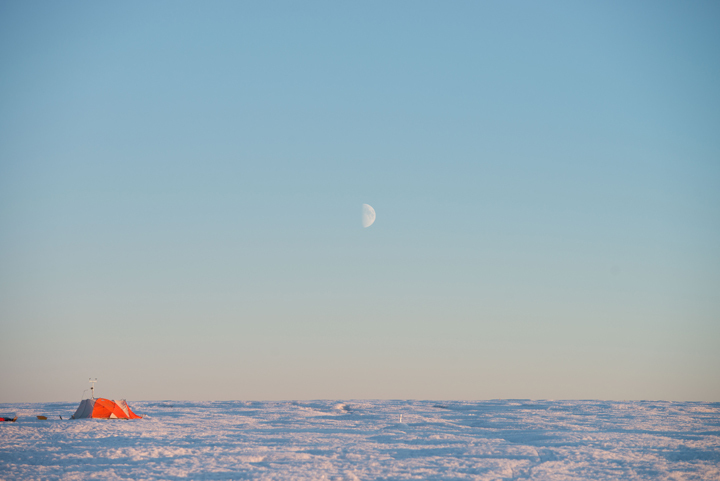 In the coming posts, we will send updates on how the work is going on the ice sheet and also describe the different components of this multi-disciplinary work in more details. I hope you will enjoy reading about this exciting research project.